10-week beginners’ course starting Thursday 5th October – See our Facebook page for details. In today’s society many people have a highly pressurised lifestyle which can cause tension, fear and worry. This can create physical ailments such as backache, headache, migraine and mental strain. Through Ki-Aikido, we learn to have a calm mind and relaxed body, which gives us a practical method of dealing with many problems in daily life. In Ki-Aikido there is no aggression, tension or competition. Classes are suitable for all levels of fitness and may be practised equally by men and women of any size, age or ability. The purpose of the practice is to learn to co-ordinate our mind and body through enjoyable exercise which will enhance the quality of our lives. 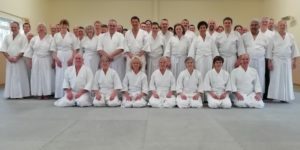 If you would like to find out more you are welcome to call Sensei James Knight on 01397-712715 or make contact by email. If you would like to come along to watch, you’re very welcome, but come a few minutes earlier so we can chat before the class begins. Soft comfortable clothing. Whether you wear an Aikido kit or soft clothing make sure it is clean. Flip flops or slippers to wear to the mat. We practice barefoot, and ensure that the mat stays clean by wearing footwear off the mat.